This sky map shows the location of Saturn and the moon on June 18, 2016 as seen at 9 p.m. local time from mid-northern latitudes. Jupiter is also visible, as shown. I'm always being asked by those who have just purchased a telescope when and where they can see the planet Saturn. Saturn, of course, is one of the most impressive objects visible in a telescope, chiefly due to its magnificent ring system. It is usually stated that Saturn is the most beautiful sight in the sky and if you have ever seen a photograph of it you will find that such a judgement is difficult to argue with. There is absolutely nothing else like it to be seen anywhere. Case in point: Right now Jupiter can be immediately identified in the western sky after sunset, thanks chiefly to its great brilliance. And when Mars is close to Earth as it is right now and also quite brilliant in the southeast sky as darkness falls, we can immediately recognize it by its distinctive fiery orange color. And yet to the naked eye there isn't really anything distinctive about Saturn. True, it appears as a bright "star" shining with a steady, sedate yellow-white glow, but it really isn’t all that eye-catching. Indeed, many beginners may have passed over it visually without knowing exactly what it is. Some nearby benchmark would certainly help to guide one to it. Saturday (June 18) is just that night! About one hour after sunset, look toward the south-southeast sky. Roughly one-quarter up from the horizon to the point overhead will be a nearly full moon, its disk illuminated roughly 98-percent by the sun. And hovering just about 2.5 to 3 degrees to the moon's lower right you'll see a bright yellowish-white "star" shining with a steady glow. And that will be Saturn. Now properly identified, if you have a telescope, and have never seen the "lord of the rings," you can finally try it out on Saturn. Any telescope magnifying more than 30-power will show them. A 4-inch telescope at 100X or an 8-inch telescope at 200X will provide a memorable view. The rings consist of billions of particles ranging in size from sand grains to flying mountains, which are made of – or covered by – water ice. This would account for their very high reflectivity. The reason that "rings" is plural and not singular is that gaps of brightness differences define distinct sets of rings. Right now, the north side of the rings are tilted 26 degrees toward Earth. They haven't been this wide-open since May of 2004, so now is a good time to check them out. In fact, the rings are currently tilted almost to their maximum angle toward Earth. The rings now extend beyond both the north and south poles of Saturn, affording a clear view of their outer perimeter all around. If you extend an imaginary line from the moon through Saturn and continue out for more than twice the distance between the two, you’ll come to the bright red supergiant star Antares, marking the heart of Scorpius, the Scorpion. And well off to the west (right) you’ll come to the distinctive yellow-orange glow of Mars, currently outshining both Saturn and Antares. Take note that as the night progresses, the orientation of the moon relative to Saturn will appear to change, and they will be drawing farther apart from each other. 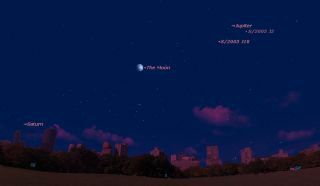 By 4 a.m. your local time on Sunday (June 19) they will be very low above the southwest horizon, Saturn appearing almost directly below the moon and about twice as far apart compared to Saturday evening. And if clouds obscure your view, don’t fret. You'll have another chance to see moon near to Saturn (though not as close as on Saturday) on Friday evening, July 15.